Hatters boss Nathan Jones believed that yesterday’s magnificent 5-1 victory over Plymouth Argyle at Kenilworth Road was like a return to the glory days for his club. With over 10,000 crammed in, Town swept aside their opponents with a truly scintillating display, scoring four goals before the break, with some pass and move football that was way above their League One status. Jones felt that the level of performance and occasion harked back to the times when Hatters had been a Division One side for a decade during the 1980s and early 1990s, welcoming the likes of Liverpool, Manchester United and Arsenal on a regular basis, as he said: “There were a lot of people from Premier League and Championship clubs here because of the international break. 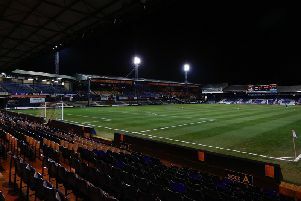 “They see a full house at Kenilworth Road, a lot of them would have remembered Kenilworth Road back in the glory days when they were in the top flight, but back then wouldn’t have been any better than it was today. “What a wonderful performance that showed our club in a great light. "The fans were magnificent from start to finish and to be fair to Plymouth fans they contributed as well. "They travelled up here, which is difficult, a hell of a journey and it showed our club in a great light, so I’m very proud to be manager of this football club, every day, but especially today. “The first half performance, I won’t make any apologies about it, I thought we were wonderful, I really did. "It's as good as performance that we’ve had since I’ve been here and bear in mind we’ve scored eights and sevens, but the way we were, the way we managed them, intensity we showed, the way we moved it, it was really a proud moment for me. Town's dominance was rewarded with some stunning goals in the first half, as they changed ends 4-0 to the good. Although they couldn't quite reach the same levels in terms of chances converted after the break, Jones felt his side actually created just as many opportunities to do so. He added: “They played 4-5-1 second half, and sat back in, so it was very easy for us to get on the ball and manipulate the ball. “We could have slowed it down, but I thought we showed a real good balance in our play. "We showed real good composure in keeping the ball, but when it was on, we did, because we had lots of chances. "(Aaron) Jarvis had a chance, James Collins should have had a penalty, we scored, the keeper’s pulled off a wonderful save from Sonny Bradley and we’ve got in great areas. "Elliot Lee’s shot past the post, Harry Cornick’s shot weakly, so we're talking about eight, nine, 10 chances second half in a game where you thought it wasn’t going to be the same, but it was. "I think we showed immense control and balance and didn’t let them get the next goal, as if they got it, I don’t think it would have affected the result, but you never know."